Yep! That's what I could use right about now. It is COLD here in New Jersey today (what is up with that Mother Nature?!?) and as I sit here and type this post my toes are numb and fingers are frozen. Brrr .... Well since we won't be heading to the beach for at least another 4 months I might as well relive the memories a bit with this layout I created using the fabulous March kit Into The Woods from Studio Calico. This layout actually uses bits and pieces from not only the main kit, but also several of the add ons as well. 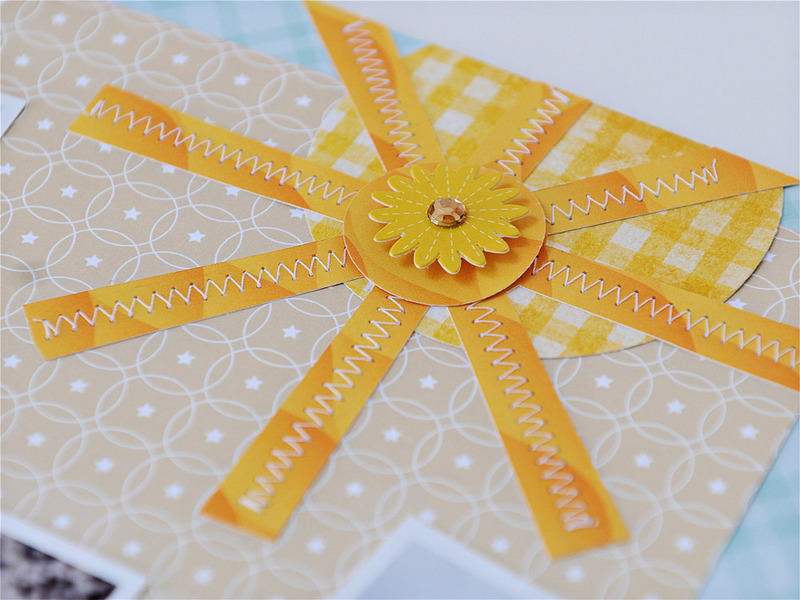 I loved the soft muted color palette of many of the papers in this month's kit and with this layout I was going for a whole sun, surf, and sand theme with the papers that I chose. The wave paper from the Cosmo Cricket Salt Air collection is really fun and I fussy cut a strip to use as the border along the bottom of my KI Memories envelope as well as to hold several of my photos (not sure you can really tell from the pic but the photos are actually tucked behind several of the "waves" of the paper). Feeling the same way as I stare out my window at the blustery wind ans snow. Love the wonderful hit of summer layout!! each time i see one of your SC layouts this week, i think "no, THAT'S my favorite". lol! i really, really like this one. such great colors for beach photos, and love how you used the wave paper on there. Have I told you how much I loooove your SC layouts? Super fab! And we need to plan our shopping trip. :) My time here is dwindling!